Carol Geary and Karen Schumacher explain some of the most vexing issues in nursing care – effective transitions for patients who move from one care setting to another. The evidence points to major issues in health care that add up to astounding costs – readmissions for Medicare patients alone add up to billions of dollars. Geary and Schumacher address this issue theoretically by proposing an integration of transitions theory and complexity science. Their work provides a new and expanded perspective that can improve outcomes for people who are transitioning from hospital to home. 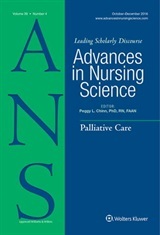 My research addresses care transitions from hospital to skilled nursing facilities among aging patients with advanced chronic disease. I am specifically interested in the multiple perspectives of patients, informal caregivers, and health care providers as described within this paper and suggested by viewing the phenomenon through a complexity lens. Professionally, as an administratively focused nurse functioning both within and as a consultant to hospitals, the dynamic of care “across the continuum” intrigued me. When Dr. Sheila Ryan introduced me to complexity science in an informational interview for the PhD program in nursing at UNMC, my initial response was: “THIS changes everything.” After two years of study, I remain fascinated by the challenge of viewing the world through this new lens.